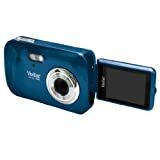 The Vivitar iTwist is often purchased as a first “grown up” camera for youngsters. It doesn’t look like a typical kids digital camera, yet it is compact and simple enough for kids to use without any adult supervision. It comes in lots of colors, including blue, pink, black, red and yellow. With certain colors available at under $40, there is the chance to get your hands on it for a great price. View the entire color range here. Reviews of this particular model are mixed, but we feel that it provides really great value for money. With great value pricing for a 7.1MP camera with lots of features that you will never find on a typical digital camera for kids (such as red-eye reduction, self timer and auto focus) this model simply cannot be beaten. Sure, it might not last forever, but it is sure to keep kids happy until they are old enough to move on to a more sophisticated model. This is perfect as a “real” digital camera, as opposed to an interactive toy. Older kids won’t be embarrassed to use this model, because it looks like an adult version and not a play thing. Don’t forget that because the Vivitar iTwist ViviCam is not a toy, it doesn’t have the durable, protective housing that kids cameras aimed at very young children have as standard. So it is best purchased for older children who are more likely to look after it. In the hands of a pre-schooler, the iTwist is unlikely to last very long! It is always nice to find some accessories to go with a camera. Previously there was an iTwist camera with an accessory pack that included an 8GB memory card, a mini tripod, a pack of screen protectors and a cleaning and care kit. However, all these items are available separately on Amazon and can make a gift even more special as, especially if you are thinking of purchasing this for a teenager, they will have all they need to get started on their photography journey! A flexible mini tripod is a particularly good accessory as it creates lots more photo opportunities, and allows the photographer to be part of their own pictures! Vivitar makes a great, affordable camera that anyone can create memories with. I’ve owned several vivitar cameras over the years and have had no complaints. My daughter absolutely LOVED this camera and I loved the price! She had been wanting a camera for a while, but a comparable camera at even Wal-Mart runs $100. I am very pleased with this purchase and she’s ecstatic with the features. Be prepared to purchase rechargeable batteries though because they’ll burn through them.